The relentless pace of the rugby calendar is such that there is barely time to catch one's breath before the important business of the back-to-back European clashes are upon us. Another hugely successful month for Ireland will ensure that the international players are returning to their provinces full of confidence. And they must hit the ground running as the focus quickly switches to the chase for European glory, with all roads leading to Newcastle next May. Headaches: For all of Leinster's undoubted strength in depth, they have to dig deep to plug what is a sizeable hole in their midfield. With Robbie Henshaw, Joe Tomane (both hamstring) and Rory O'Loughlin (knee) all currently sidelined, Leo Cullen's biggest task is to find a suitable partner for Garry Ringrose. The obvious option is Noel Reid, who played 80 minutes in the No 12 jersey last weekend, which is an indication that he will slot in there. Despite Leinster using Reid as out-half cover in more recent times, the 28-year-old has played most of his professional rugby at inside centre. Outlook: Defeat in Toulouse last time out has left the defending champions playing catch-up and they are on the road again next week. Bath are enduring a tough season with plenty of issues off the pitch as well as on it. The English side will know that if they could conjure up an upset, it would bring them right back into contention. As it is, however, their Premiership struggles in which they are currently languishing in eighth position, will mean that they may well have one eye on domestic matters. Headaches: With all that was going on during the November internationals, it somewhat slipped under the radar that Jean Kleyn had to undergo surgery on his thumb, which has ruled him out until the new year. Billy Holland is an able deputy, but there is no doubt that Kleyn's physicality is a huge loss to Munster, especially against a bruising French pack. 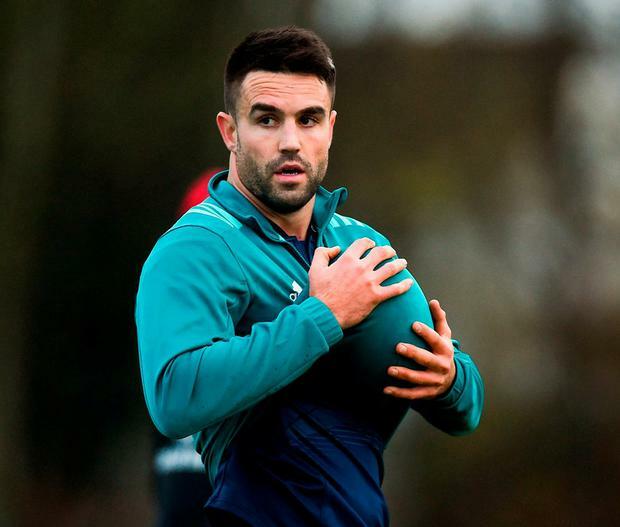 Outlook: It's difficult to overstate just how important the return of Conor Murray is to Munster's chances of finishing top of this tricky pool. Add in the return of Chris Farrell and suddenly the Reds' back-line is a very different attacking threat. Castres' win over Exeter reignited their challenge and while they generally take their eye off the ball in Europe come December, they may will give it a rattle in Thomond Park. Headaches: Dan McFarland will have been delighted to see how well Will Addison performed for Ireland, he will have been less pleased to see him fail his HIA and be replaced at half-time against the USA last weekend. All going well, the versatile back should recover in time for next week. Craig Gilroy is battling an ongoing back issue, which makes Henry Speight and Louis Ludik's return from injury all the more timely. Outlook: Having gotten off to a positive start with a win over Leicester, Ulster were brought crashing back to reality by Racing 92 in Paris. The Scarlets know that they must win to keep alive their slim hopes of qualifying for the knockout stages and with their backs against the wall at home, they will be a tough test. Headaches: Bundee Aki has been granted leave to return to New Zealand to get married, which in itself is indicative of how Connacht are looking at their Challenge Cup campaign. Kyle Godwin has now settled and is set to replace Aki in midfield where he will partner Tom Farrell, who will have benefited hugely from his recent week spent in Ireland camp. Kieran Marmion's absence is also a blow, but Caolin Blade is having a good season and is likely to have played against Perpignan anyway. Outlook: Perpignan are without a win all season in the Top 14. Ten defeats in 10 games has them destined for the drop to PRO D2 unless there is a major change in their fortunes. Securing their top-fight status is much more important than a run in Europe, and while Paddy Jackson's side drew with Bordeaux last time out, their interest levels in a trip to Galway are likely to be minimal.